I have a complicated relationship with food. I grew up eating Thanksgiving dinners that included turkey and stuffing, steak and mashed potatoes, stir-fries, nian gao (sticky rice cake), and fried eggs with soy sauce. I never thought twice about it. I never defined one meal or another as American food or Chinese food, just distinct dishes that each of my parents made, sometimes together. At some point, though, I started to see that certain dishes were special. Not special in a celebratory sort of way but special in that they somehow signified to others that “this is different.” Sometimes it was trendy. Sometimes it was strange and exotic. Sometimes it sparked conversations about identity, family, and history, and that’s what I began to see food as: a way of creating myself through my favorite foods, of expressing myself through the conjunction of foods that surround me and that I find comfort in today. Communal meals, for me, have always been about sharing stories. The different flavors, ingredients, and ceremonies of eating become an opening for me to express the intricacies of my mixed-race identity in America and abroad. Food is deeply embedded in both my personal and larger histories, and the simple exchange of sharing a meal becomes the framework for a relationship in which boundaries can be tested and new bonds formed. Depending on whom I am eating with, I can connect with them over common memories of a certain recipe or use a particular meal as a springboard for a conversation about myself and my heritage. All food is weighted with memory and meaning. It often resonates with histories of colonialism and subjugation, or trade and fusion cuisine, or questions about expertise and who gets to be the authority on whether something is “authentic” or “gourmet.” These fraught histories and politics interact with the deeply intimate and personal experience of sharing meals with others. On my part, deciding to share a particular meal can be an exercise in vulnerability and trust. As I create myself through food, so do I create and recreate my relationships with others. The choice to share my favorite meal with another person involves engaging with the tenderness of my identity on my own terms. It becomes a point at which I can bond with another person through shared experience. I find that food helps me connect with my existing communities and form new ones. Through the act of eating, I engage with myself and my heritage, my culture, my life experiences, family, identity, and relationships with others. Far from a simple and necessary act, sharing meals allows me to make and remake myself and my place in the world, alongside people I care about. 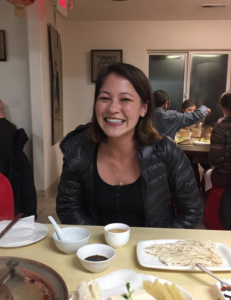 Bio: Ava Kamb is a member of the field team at APANO, the Asian Pacific American Network of Oregon. Born in Salt Lake City, Utah, she spent most of her life in the California Bay Area before coming up to Portland to complete a degree in religion at Reed College. She is mixed-race and has always been interested in multifaceted identities and the blurring of boundaries. In her free time, she enjoys watching documentaries, traveling, and exploring Portland and the Pacific Northwest. APANO: Established as a 501c3 nonprofit in 2010, the Asian Pacific American Network of Oregon (APANO) is a statewide, grassroots organization uniting Asians and Pacific Islanders to achieve social justice. They use their collective strengths to advance equity through empowering, organizing and advocating for communities. APANO’s strategic direction prioritizes four key focus areas: cultural work, leadership development, community organizing, and policy advocacy and civic engagement. Through APANO’s arts and cultural work, vibrant spaces are created where artists and communities can envision an equitable world through the tool of creative expression. APANO strives to impact beliefs, center the voices of those most impacted and silenced, and use arts and cultural work to foster unity and vitality within communities. Learn more about APANO on their website and read more writings by APANO members on Medium.